Our basic deal room price will give you the best value for money. Want to book days in advance? Enjoy your early bird discount rate! Save more money with minimum stay for 2 days package! 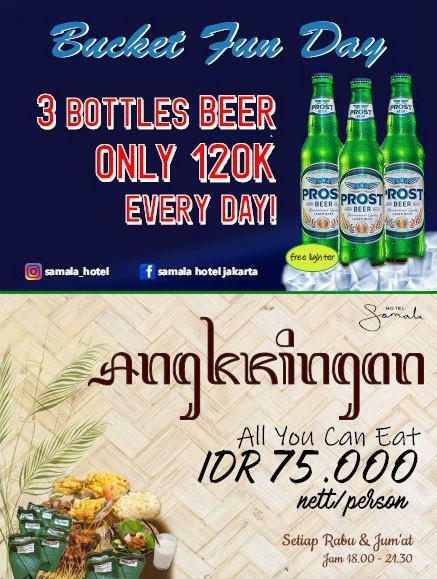 Samala Hotel Jakarta is understated epitome of a modern elegance design hotel, where you will always be welcome and served with heart from the professional and caring staff. Samala Hotel Jakarta offers fantastic services and facilities to help you unwind after an action-packed day in the city. Enjoy unparalleled services and a truly memorable stay at Samala Hotel Jakarta. Strategically located at Daan Mogot – Cengkareng – Puri business district, vibrant tourist attractions and entertainment spots are just around the corner, and it’s just 20 minutes drive from Soekarno-Hatta International Airport. Our friendly and familiar staff is ready to make sure your stay is enjoyable and comfortable at our 182 modern design rooms and suites. On the lobby level you will find a cozy restaurant with classic interior, dominant with calm and warm colors. The restaurant could serve up to 100 persons at the same time. Working hours are from 6:00 AM to 11:00 PM. Breakfast on weekdays are from 6:00 AM to 10:00 AM. On weekends from 6:00 AM to 10:30 AM. Our chef will surprise you with the authentic taste and the variety of international cuisines. Corporate meeting, social event, gathering, birthday or your intimate wedding reception, at Samala Hotel Jakarta – we are ready to make it happen and adding the great experience for your events. Each of our 5 meeting rooms equipped with LCD projector, screen, sound system, flipchart and internet Wi-Fi.